Extension Matters | Expert advice from West Virginia State University Extension Service. Our community arts initiative in downtown Beckley, which we first shared in this post, has continued throughout the summer with trail improvements and more Try This WV mini-grant projects along the McManus Rail Trail. 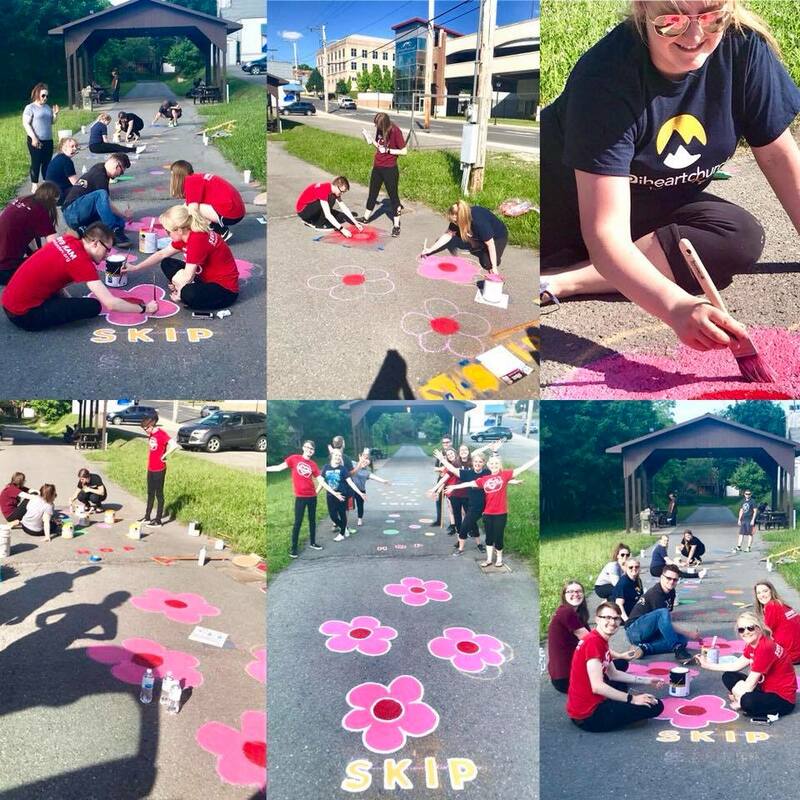 Extension Agent Christine Kinder led beautification projects with a team of scouts, volunteers and the Downtown Beckley Business Association (DBBA). The DBBA was awarded a second Try This WV mini-grant for public art that promotes a healthy community. This summer’s Try This WV projects included painting a fun “fitness path” onto the trail with colorful flowers, stars, circles and waves encouraging kids to skip, hop, jump and twirl. There’s a colorful hopscotch game at the end of the path as well. With help from a local Boy Scout troop, two beautiful compass designs were painted on the trail. The Public Works department installed two new bike racks downtown, including one at a newly revitalized community center that offers after-school tutoring for students. Newly designed trail banners were also purchased and placed in visible locations along the trail. The ongoing efforts to improve and bring attention to McManus Trail through beautification have inspired new project ideas and collected additional partners. With collaborative efforts from new partners including Piney Creek Watershed, plans are underway to develop an art park in a historic area of the McManus Rail Trail. This area of the trail was previously a railroad train depot. 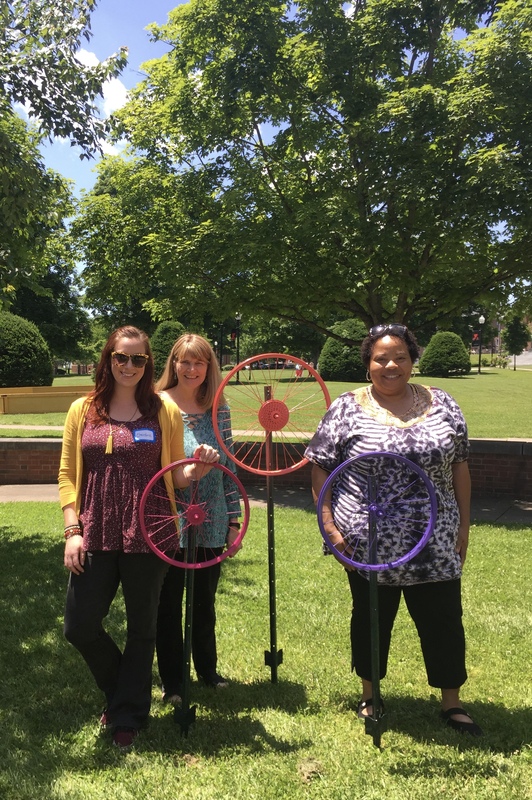 WVSU Extension Service, Piney Creek Watershed and the City of Beckley, along with plenty of volunteers, have plans to create a family-friendly atmosphere with colorful, interactive and educational additions. We hope to include musical playground equipment, colorful umbrellas for the existing picnic tables, purchase historical signage giving visitors a visual history of the area, and continue painting murals with help from local organizations. Currently, two murals are in process with design plans for more in spring 2019. Since painting began this summer, we have received inquiries from businesses and organizations about how they can be a part of the projects. Community-based service organizations can sponsor a section of the wall that cover artist fees and supplies. We are currently working with the Kiwanis Club of Beckley on a mural sponsorship that will be incorporated into the art park mural plan. The summer heat has settled in and, pretty soon, it will be time for canning all of the produce that has grown over the last few months. Depending on if you had planted anything in your own private garden, it shouldn’t be long before it starts to produce, depending on the type of plant. The time is also approaching for various berries, such as blackberries, to be picked. No matter what you deal with, something that they all have in common is that they can be canned. Canning can help preserve for later all of the produce that you have harvested. Canning can be versatile, because you don’t have to keep the produce in its original form. The process allows you to can it in various forms, such as jam, jellies, soups and more, and helps to save on preparation when you get it out for use later. While canning can be incredibly useful, it is important to do so safely. The most important safety measure is to use a pressure canner instead of the traditional water bath method. While you can use the water bath method for certain foods, it is unwise to do without a pressure cooker. The pressure cooker helps to can food safely due to the high temperatures it uses. The high temperatures help to prevent the risk of botulism, which can become a deadly toxin. Also don’t get just any pressure cooker. Ensure that the one you get is specifically meant for canning. When canning, make sure that you follow the most recent canning instructions carefully. The next important safety measure is making sure your equipment is properly cleaned and sanitized. This mostly relates to your canning jars and lids. First, clean the jars and lids with hot, soapy water and make sure to dry it thoroughly. Then get a few decent-sized pots and fill them with water. Next, heat the water until it is near to a boil. Have one pot for your jars and another for your lids. Let them sit long enough that they’re sanitized enough for use. Use tongs or something similar to get them out of the water and then let them sit enough to dry. Make sure you are careful when dealing with both the jars and lids due to the extreme heat. Once you have properly prepared your produce in whatever method you desire, place it in the jar. Properly place the lid on correctly. Place your jars in your pressure cooker and ensure the lid is sealed. Start heating up the pressure cooker until it reaches the desired temperature. Monitor the pressure cooker to ensure the temperature stays constant for the desired length of time. Once done, make sure the pressure cooker cools off enough for you to retrieve the canning jars. Lay out a towel on a nearby counter to place the jars on. Let the jars cool off and inspect them periodically to ensure that they are sealing properly. You can tell which jars have been properly sealed by inspecting the lids. There should be an indentation in the lid if it is sealed. If a jar doesn’t seal, don’t keep it, because unsealed jars can be dangerous. You can easily learn more about this by doing research on the Internet or by asking those that are experienced with canning goods for advice. If you have any questions, you can contact me at the WVSU Extension Office at the Welch Armory. I am available Monday through Friday from 8 a.m. to 4 p.m. and by appointment. Feel free to give me a call at (304) 320-5446. Going hiking or ATV riding this summer? Here are some ways to stay safe on the trails. Summer is in full force and the time for outdoor activities has returned. One of the most prevalent of these activities is taking to the various trails, whether they be for hiking or ATVs. These trails see a lot of activity this time of year, and you will need to be properly prepared before venturing out. Safety is important, and there are certain rules that apply to the trails that you need to know about in order to remain safe. We’ll start by talking about safety on hiking trails. Before setting out, make sure you know what the weather forecast is and plan for it accordingly. Make sure you’re dressed for hiking with proper clothing and shoes. It would be advisable to bring a trail map or make use of other methods such as GPS in order to know where you are. Be sure to bring supplies such as food and water depending on how long you plan to be hiking. Try not to go by yourself as a safety precaution, but if you do, be sure to tell someone where you are and a time for your return. This will help so that if something happens, someone knows where you are and can help you. Try to stay on the designated trails and not wander off. The trails are marked for your safety and it would be easy to get lost should you wander too far from the trail. Watch where you walk and put your hands. This can help you avoid anything harmful like poison ivy or snakes. Speaking of snakes, be wary of the wildlife. Any wildlife can be dangerous if it feels threatened or feels cornered. Also everyone has their limits as to what they can do. Try not to overexert yourself to try to prove something. Take your time and just enjoy yourself. Now to deal with trails that are ATV accessible. The safety rules I’ll be mentioning apply to the Hatfield-McCoy trail specifically, but can probably be applied to other trail systems. If you wish to use the Hatfield-McCoy Trail, you must have a valid permit. You must wear the proper safety gear like helmets. No alcoholic drinks of any kind are allowed to either be consumed or carried. It is requested that you obey all of the signs throughout and that you stay on the marked trails. Avoid trying to enter areas where signs such as “no trail” or “no entry” are posted. Drive at reasonable speeds and make sure that those driving the ATVs meet the age requirement for driving their vehicle. If you are signaled by those that work on the trails like a ranger, stop for them. Be sure you have some form of identification on you at all times. Also if you are below the age of 18, adult supervision is required. Try not to make a mess of the trails, which include no littering. There is also no camping allowed on the trails. If you want to go on the trails, remember that they are open from sunrise to sunset, so plan accordingly. You can easily learn more about this by doing research on the Internet or by asking those that are experienced with going on trails for advice. If you have any questions, you can contact me at the WVSU Extension Office at the Welch Armory. I am available Monday through Friday from 8 a.m. to 4 p.m. and by appointment. Feel free to give me a call at (304) 320-5446. That is our slogan at the West Virginia State University Economic Development Center (EDC). We are the region’s premiere co-working space for the creative economy and home to a variety of small business owners, creative professionals, freelancers, non-profit and community development organizations. We’ve created a state-of-the-art facility jam packed with resources and perks to help grow your business or idea! Choose from a selection of super affordable membership plans that meet your individual working style and needs. Here is what we have to offer in a nutshell. Office Space. Whether you are looking for a private, long-term office or you work from home and need a change of scenery for the day, the EDC has you covered. 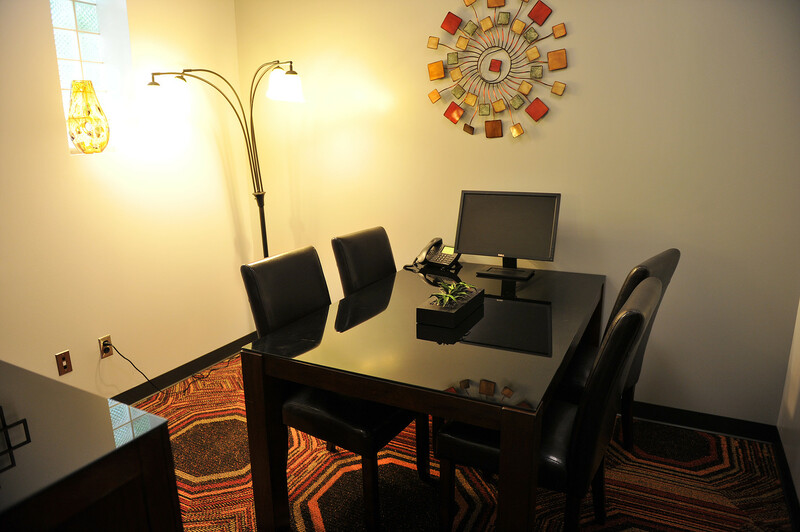 We offer private, fully furnished office spaces, a flexible shared office and free public workstations with Wi-Fi, phone, coffee and other business-related services. Membership plans allow our coworkers extended after-hours access to our facility and production spaces. Meeting Space. Need to accommodate larger groups for trainings, presentations, board meetings or even catered social events? The EDC features three flexible meeting spaces with projectors, mobile monitors, wireless Internet, whiteboards, conference phones and more. We can even livestream your event! Multimedia Production Facilities. Lights, camera, action! 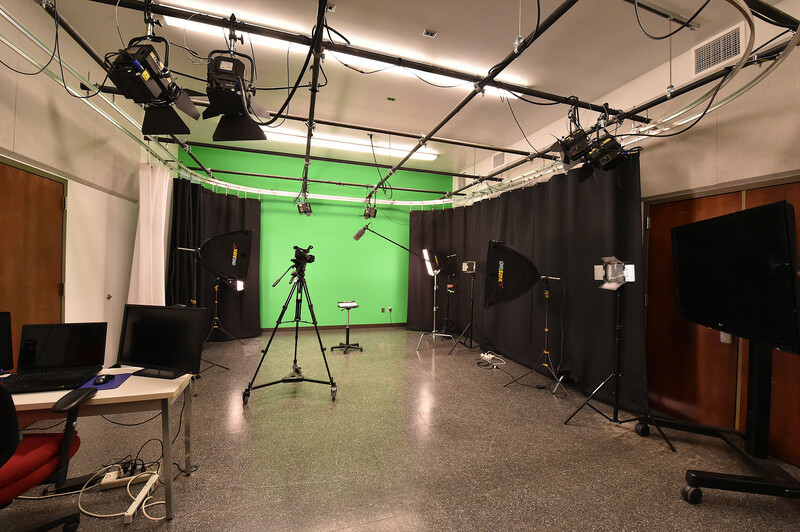 Create your own digital content such as commercials, voiceovers, product shoots, music and graphics in our fully equipped capture studio, voice studio and editing suite. Networking Opportunities. Work within a community of like-minded individuals, spark new collaborations and meet potential clients on a daily basis. Here at the EDC, we’ve created the perfect communal setting for building relationships and extending your business network. Programs and Services. Need help with your business plan, marketing or logo design? We offer a myriad of business development services with help from coworkers, mentors, community and state organizations and WVSU professors. Plus, our Creators Program delivers free community workshops, panels and talks focused on key skills and knowledge essential to “creating” for mass media and art. Topics include digital photography, 3D animation, independent publishing, Adobe Creative Cloud programs, music for media and much more. To find out more about the EDC and how you can become a member, contact us at 304 720-1401 or via email at jrinehart@wvstateu.edu. Stop in for a tour anytime M-F 8:30 a.m. to 5 p.m. We are located at 1506 Kanawha Blvd. West in Charleston. Find us on the web at www.wvsuedc.org and like us on Facebook. Students at Mary C. Snow West Side Elementary School in Charleston are helping to guide their own science-based lessons and activities with a new after-school initiative led by the West Virginia State University (WVSU) 4-H program. Extension agents are working with grades K-5 to offer STEAM (Science, Technology, Engineering, Arts and Mathematics) programs based on the needs and wants identified by students themselves. This differs from traditional approaches, in which predetermined lessons and materials are often brought into schools without input from the students being served. “Doing what the students want to do is important to me, because that will have the greatest impact on them, give them ownership over their projects and help them see that the possibilities are endless for their futures,” Sterling said. WVSU staff and student volunteers launched the first set of STEAM activities at Mary C. Snow’s after-school program last fall with a curriculum designed by WVSU student Ashley Current focusing on recycling and reuse, culminating in a Halloween-themed activity in October in which students made their own costumes using recycled materials. According to school officials, the program is piquing students’ interest in science. With sessions resuming this week, Sterling plans to continue developing lessons based on student feedback. Recent talks with fourth and fifth graders revealed interest in making such things as volcanoes, slime, cars, planes – even shoes. In keeping with the holiday theme, we decided to ask our agents and staff, “What is your favorite gift you’ve ever received for the holidays?” From funny to heartwarming, and everything in between, read on to see what has topped their lists over the years. Matt Browning, Director of Communications – Well, there was the time my mom left all my He-Man toys at her office and told me they were on back order with Santa Clause and he’d drop them off soon. Although, my favorite may be my Super Nintendo. I still have it. And still play it. Tabitha Surface, Extension Agent – Shirt-boxes filled with Nancy Drew books! Carolyn Stuart, Interim Assistant Program Director for CED & FCS – A Take My Hand and I’ll Walk with You doll. Kaysha Jackson, Extension Agent – My favorite gift ever was given to me by my older brother. I was 7 years old. On Christmas Day, he walked in the door with a “My Size” doll who stood on her own, had blue hair and came with two tiny discs you could insert in her back to make her sing! What made it even more amazing years later was that this was a time when we had absolutely nothing. Our family was struggling financially, and he began working at the local grocery store to help my mother. He would give my mother most of his check and would save the rest, simply because he wanted to make sure I had a great Christmas and never felt the impact of what we were going through. Chris Zeto, Extension Agent – An electric scooter when I was in grade school. With snow on the ground and Santa slippers on my feet, I had to take it for a spin as soon as I saw it! Tammy Hauldren, Extension Associate – The best gift for me always is snow on Christmas Eve and Day! Stacy Herrick, Communications Specialist – The year Cabbage Patch Dolls came out (1983), my parents tried and tried to find one for me for Christmas. Lucky for them, I was too young to make a big deal about it not being under the tree that morning. However, when we were leaving to go visit my grandparents on Christmas afternoon, my dad found a Cabbage Patch Doll sitting on the front seat of his car with a tag that said, “To Stacy, Love, Santa.” To this day, my family still has no idea who left that doll for me (and I still have the doll)! The cold of winter has started settling in, and the holiday season is upon us. It’s the time of year where people rush into stores in order to find that perfect gift and all the fixings for the festivities to come. Something that many find little time to think about, however, is holiday safety. There are a variety of things that you can put into practice in order to keep yourself safe. Decorating for the holidays is a serious business, often involving out-of-reach portions of your house or yard. When putting up lights or similar decorations, use the proper tools. If it requires a stepladder or ladder, use them. Don’t try to substitute with a chair or any other available furniture. Furniture wasn’t meant to be used as support, so they aren’t made to support much weight, which could make it collapse. When using any form of ladder, make sure that it is on an even surface and that it either won’t slide or make sure someone is there to hold it steady for you. Another important holiday safety tip is to travel safely. Whether you’re traveling by car or just walking to your destination, be careful. Winter is here, so you may be dealing with either snow, ice or some combination. Either of those weather conditions can be dangerous if underestimated, so exercise caution when dealing with wintry conditions. Snow can also be dangerous for many reasons. One such reason is that ice can form underneath that wouldn’t be visible because of the top layer of snow. Another factor you will have to deal with is black ice, also known as glare ice. This type of ice can be transparent and can be difficult to detect. Black ice can make the road look wet, so be cautious when traveling. West Virginia doesn’t have the straightest roads on the planet, and negotiating curves can be difficult. Bridges or overpasses have a higher chance of being covered in ice as well, so be sure to remember that while driving this winter season. If you happen to find yourself driving on any type of ice, remember: don’t panic or brake immediately. Remain calm and slowly take your foot off of the gas. Allow your vehicle to gradually slow down, while taking care to remain safe from the vehicle behind you. Search for a safe and/or secure place to park your vehicle, such as a parking lot. Just remember to make no sudden movements and that you remain cautious when dealing with ice in order to remain safe. These are just a few tips in order to remain safe this holiday season. While everyone tends to focus on the festivities, don’t forget that the winter season can be dangerous. Always exercise caution throughout the season in order to have a safe holiday. Crystal Bishop, STEM Education Coord. – My favorite holiday song is “White Christmas,” while my favorite book is The Night Before Christmas. Matt Browning, Director of Communications – The traditionalist in me will say my favorite Christmas song is “Silent Night.” The 80s kid in me will say “Christmas Wrapping” by the Waitresses. Annette Ericksen, Assistant Program Director for Agriculture and Natural Resources – My favorite Christmas song is “Have Yourself a Merry Little Christmas,” but only by Judy Garland.